I’ve never been a fan of Albert slippers with black tie. With a normal tux they look out of place and with a velvet jacket they drag the look back to the domestic engagement that the jacket is trying to escape from. Equally, patent shoes have never held much appeal. First, because patent leather is essentially cheap skin with a plastic coating – even good patent leather is not great leather – and a beautifully polished calf shines with greater depth and subtlety. And second, because the shoe is so restricted to just that handful of formal occasions during the year. 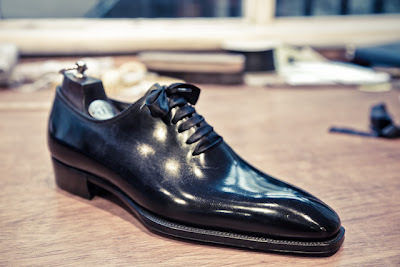 An interesting alternative is to wear those calf Oxfords with ribbon laces – as shown here, with a pair from Gaziano & Girling. 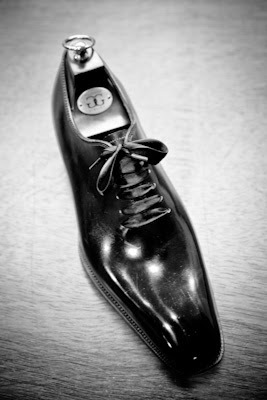 The ribbons can be inserted before an event and removed afterwards, lending a new look to an existing shoe. Shoemakers buy these in by the box, but I don’t know of anywhere in London that sells them retail. (I acquired my pair from Tony and Dean at G&G.) If anyone does and can recommend a supplier, please let us know. UPDATE: Cleverley normally sells them, priced at £10, but they are out of stock at the moment. Thanks for your comments. You can follow the discussion on Ribbon shoe laces by entering your email address in the box below. You will then receive an email every time a new comment is added. These will also contain a link to a page where you can stop the alerts, and remove all of your related data from the site. Only on the web, of course! Look under “dance shoe laces” or “grosgrain ribbon laces”. These shoes are absolutely wonderful. 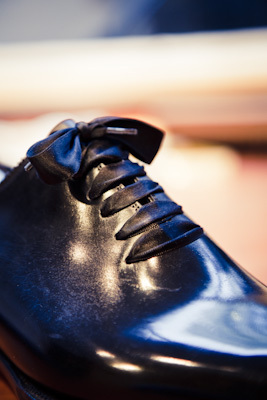 The ribbon laces are the perfect tip for added formality with a bold, yet subtly refined, style. This is a perfect way to make a shoe functional in a number of situations.